Two (or Three) Americas: John Edwards' $6M Home! ~ Android Forever! Two (or Three) Americas: John Edwards' $6M Home! This is gonna be fun! Brother Edwards, he of "Two Americas" fame, has moved into a new home. Now I understand what he meant by "two Americas." It has all come together for me. There's his America, and my America. In his America, you can have the most expensive home in Orange County, NC, taxable value exceeding $6 million. The main house, according to Carolina Journal Online, boasts a spacious 10,400 square feet. But wait, there's more! There's a recreation building with another 15,600 square feet. And it all sits on a 102 acre estate. "The heavily wooded site and winding driveway ensure that the home is not visible from the road. 'No Trespassing' signs discourage passersby from venturing past the gate." In other words, that other America damn well better keep out! And he's running for the Democratic nomination for President in 2008. I'm telling you, this is going to be fun! Hey, wait a minute. I just found out there're THREE Americas! 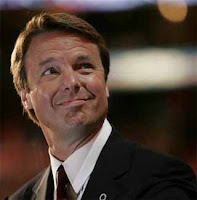 In the third America you can have a home, worth $155 million, that makes John Edwards look virtually homeless!